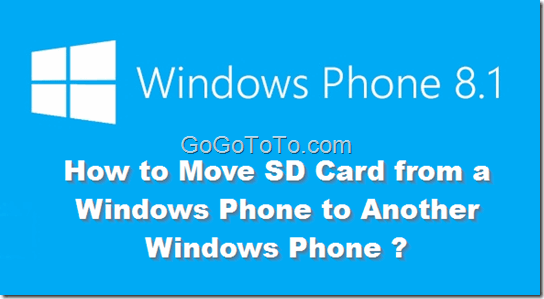 How to move the SD card from old Windows Phone to a new Windows Phone ? We actually had two type of data on the SD card: Apps and Photos (Including Video, Music files and other files). If you are familiar with computer with Windows system, you might understand a case of how to move a hard drive from one computer to another computer: When we moved a hard drive to another computer, we could see the original photos, video, music files and our document files directly, they were not changed; But we could not use the installed software, we had to install the application again, even we could see the application files and folders. 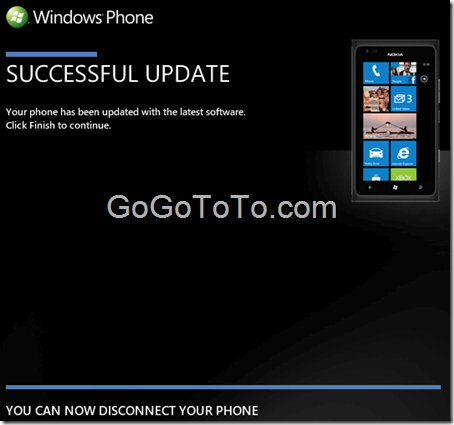 Windows Phone is Dead ? There were bad news about Windows Phone when Microsoft released its 2016 Financial Year 2016 Q2 report. Even Microsoft still earning money, but their Windows Phone was keeping losting market shares. Microsoft has lost big money on their mobile products. Fewe and fewer people are still buy Windows phones, even Microsoft’s new flagship Lumia 950 XL and Lumia 950. IDC had a report recently which was about global cell phone sales and related phone making factories’ market trend, but it even did not mentioned Windows Phone, because most of phone factories are giving up making Windows Phones since the bad customer reputation of Windows Phone. We had a news report Microsoft might provide their Windows Phone system and Windows RT system to device makers for free, no more license code. However, do we know how much the license cost is ? However we at MNB can report that a source familiar with Microsoft’s licensing scheme have shared the prices of the respective licences with us. A single Windows Phone 8 license costs close to $25 per device (or £15); a Windows RT license with the Office suite (like what the Lumia 2520 would come with) costs $90 per device (or £55). After the previous updating from WP 7.5 to 7.8, lots of users found the issue that Lumia cell phone battery power gone more fast than before. 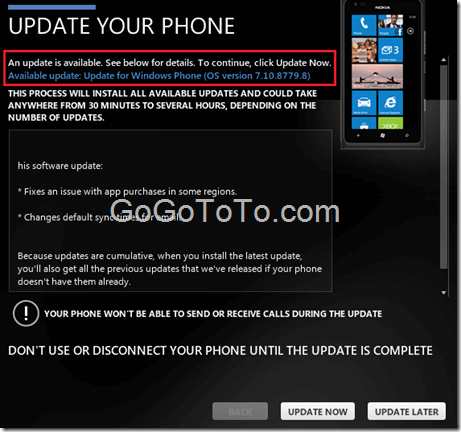 so later Microsoft released another update version 7.10.8860.142, the last version was 7.10.8858.136. We did not know when the Windows Phone 7.8 was available to push in Canada, but we just realized the Windows Phone 7.8 has been provided when we connected our Lumia 900 to PC using Zune software today. Note: Our Lumia 900 was originally from Rogers, but we are currently using 7-11 speakout service which is actually using Rogers network. So we have not tested other Lumia phone which are from others cell phone network service providers. And, during the update process, we found the interesting thing is that the updating is NOT only once time updating. The following is the first window when we connected the Lumia 900 to computer, it noticed us a phone update is available, the new Windows Phone OS version is 7.10.8779.8. 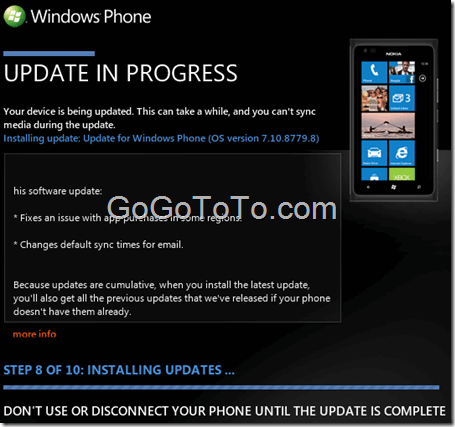 When you click “UPDATE NOW” button, after some backup things, you will see Zune software start the phone update process, meanwhile, you will see your Lumia 900 restarted several times. Finally, after another cell phone restart, there is no more update found. so the update finished. our Windows Phone 7.5 now updated to Windows Phone 7.8. We have to find the newest OS version information through our cell phone, it is 7.10.8858.136. 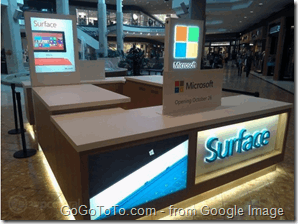 Since Microsoft Stores have not set in all over the world, for example, There will be only ONE Microsoft store in Canada, Microsoft opens some holiday popup stores for supporting, and for their new products. In this year, Microsoft will open holiday stores for their Surface tablet, Windows 8 and Windows phone 8, of course also their popular XBox products. 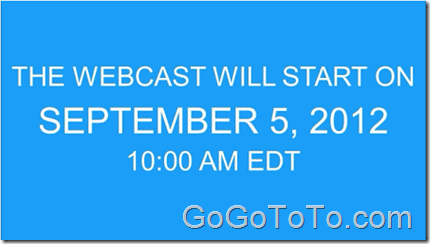 Due to report from Channelbuzz: Microsoft Canada confirmed that the four holiday locations will open October 26. There are several media reported today: Microsoft might be building their own brand Windows Phone 8, and the new phones might be released before July 2013. Actually, for us, this kind of news should NOT be a “surprised” news, because Microsoft has already announced they are building their own tablet – Surface. the tablet is kind of mobile device, so why can not they make smaller mobile device – smart phone ? Before, Microsoft might want their phone partner Nokia to expand their mobile market via provide financial support and tech support, using Windows Phone platform, however, Nokia seems does not have capability to help Microsoft’s mobile system. That might be the reason Microsoft seems make more relationship with other phone makes, such as HTC. For consumers, Microsoft band Windows phone has not clear idea currently, because nobody know how Microsoft mobile device making, even the XBox device is nice, but who can say Microsoft Windows phone device is better than Nokia phone ? But maybe we can wait and see how the Surface, if Surface is ok, then we should not doubt Microsoft phone device. DIY Unlock Nokia Lumia 710 / 800 ? How hard unlocking a smart phone DIY ? I never tried unlock a phone, but now I am interested in it, I am looking for a spare time to unlock Nokia Lumia 710, actually in most of cases, Nokia Lumia 710 and 800 seems the same kind of phone but just some hardware different, especially for firmware development, 710 and 800 always have been looked the same kind of phone but just firmware versions different, but, for unlocking, 710 and 800 most like using same guide. OK, I am not going to start the unlock right now, so today I just do some preparations, I collect some helpful information, if you can not wait, you can start now but please know I have not tried all steps myself. I DO NOT know what will happen and whether they work for your phone, please make sure you can do by yourself before you start. But, But.. please read carefully what the forum were discussed, the 5 steps just brief info, actually before you start, you have to finish some other steps first, which they will spend you a NOT short time, at least if you are new for unlocking phone, you have to understand what the software you have to have, and how to use those software tools, and, what they do for… etc. So, as my understanding by now, I have to unlock the boot loader for my Lumia phone first, otherwise the NSS tool I mentioned above can not recognize your phone in a right mode. and then, we need Nokia care suite software to do the next steps…. OK, above I just collect some information, I said I am not going to start the unlock today, I will do in other day if I get time. Please find your information if you think you need more, and please note you take all risks by yourself. 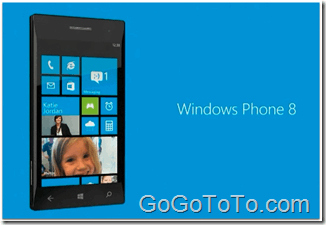 If Microsoft’s Windows Phone 7 is not people’s best choice, then how about Windows Phone 8? Samsung has released their Windows Phone 8 actually, but seems people are still waiting for Nokia’s Windows Phones. Microsoft pushes big news in this week, just after their Surface tablet, today they announced the new smart phone platform: Windows Phone 8. OK, what the main feature of Windows Phone 8 ? 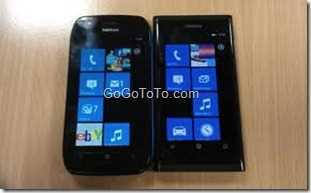 What the big different with Windows Phone 7 and Windows phone 7.5? I think the main changes based on previous Windows phone is: Windows phone 8 shares core with Windows 8 ! It means: Windows phone 8 will use the same core with Windows 8, and more, it means Windows Phone 8 will be more and more closer Windows 8, and further more, it means Windows Phone 8 will be just a kind of Windows 8 System. 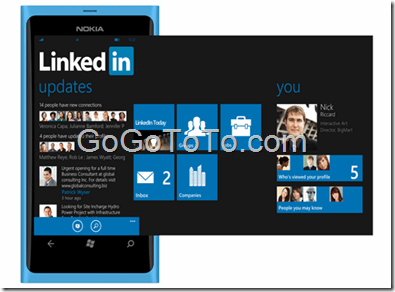 All applications on Windows 8 can run on Windows Phone 8 or just need minor changes and adjustments. This is really a new and great feature ! It will benefit to not only consumers, but also developers, and hardware companies. More details please visit Microsoft Windows Phone official blog.